As a violent storm swept across Malta a few weeks ago, Doris Doublet, 85, recalled a similar tempest during her childhood, when she spent three days anxiously awaiting news of her father, trapped by huge waves in the Ricasoli lighthouse. Toni Spiteri, who resided in Valletta, tended to lighthouses during the war and the years that followed and his daughter spent her early years growing up in one such structure at Tigné, narrowly escaping its destruction in a wartime air raid. 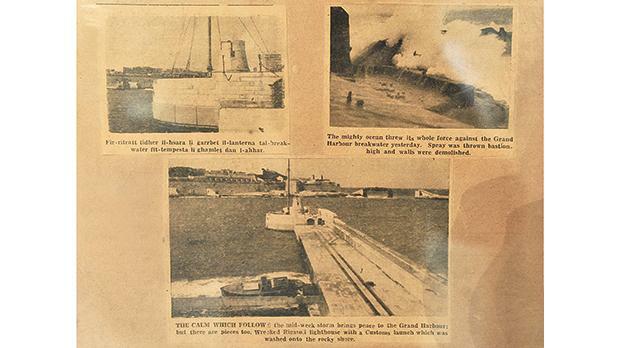 It was some years later, in February 1949, that tragedy nearly struck again. Her father, then aged 48, had spent a normal night of work manning the Ricasoli lighthouse but, early the next morning, strong winds and huge waves smashed the glass on the upper level and broke through the doors below, flooding the entire building. With waves relentlessly crashing over the breakwater that connects the lighthouse to the mainland, he and a co-worker, Salvu Micallef, 54, of Mosta, were cut off and trapped inside. When he did not return home, Ms Doublet and her family feared the worst. “I remember my mother crying. We all thought he was dead, everyone was going around saying he had died,” she said. In an interview given a few days later, Mr Spiteri said the lighthouse had continued to flood and the two men were eventually treading water in the dark. With the waves showing no sign of abating, they found themselves stuck there for the whole day and into the night, slowly losing strength and with no water except that used to flush toilets, while praying to Our Lady of Mellieħa for rescue. Eventually, early on the second morning, they realised their only hope was to brave the breakwater outside. Saying another prayer to Our Lady, they made their way through the wrecked doors, according to their own reports days later, getting out moments before the lighthouse machinery crashed down on the room they had just been in. The two men battled their way across, occasionally stopping to help the other along, making it up the ladder and onto solid land with their last bit of strength: “our hands swollen, our clothes torn and our bodies broken,” as Mr Spiteri put it later. They were rushed to hospital, where they were kept for a few days. Ms Doublet recalls that when he finally returned home, he said it was the thought of his family and the need to see them again that had carried him through. 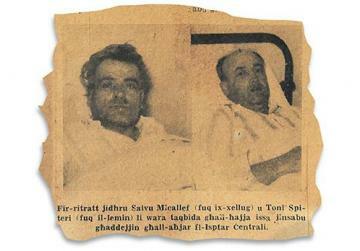 But there still was one bit of business to wrap up: shortly after his ordeal, Mr Spiteri travelled to the Sanctuary of Our Lady of Mellieħa to show his gratitude for the intercession he believed had saved him, leaving there a framed record of the experience that hangs on the walls to this day.